Is the British government considering a Jerusalem embassy move just like America did? By TruePublica Editor: The United States opened its new embassy in Jerusalem on May 14, a move that delighted Israel and infuriated the supporters of the Palestinians and their struggles. 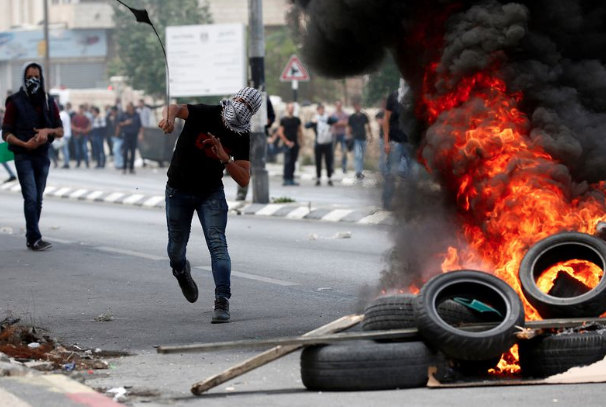 The result was that tens of thousands of Palestinians converged on the Israeli border in protests – dozens were killed as Israeli snipers indescriminently took aim with the legal protection of an unapologetic apartheid state. It was the deadliest day in Gaza since the last Palestinian’s war with Israel in 2014. Not that they are wars really. More than 1,200 people were also wounded by Israeli live fire, many ending with life-changing injuries – the Gaza Health Ministry confirmed. The move was a diplomatic victory for Israel. This was a decision forced by Donald Trump who said the move didn’t prejudge the city’s contested final status and stressed that the U.S. is still committed to helping the sides negotiate peace, which was clearly not the case. Any possibility of a peace deal has since been blown out of the water. At the embassy inauguration, Israeli Prime Minister Benjamin Netanyahu defended the military, praising soldiers protecting the Gaza border, itself little more than an unmitigated propaganda exercise as the Gazans were unable to breach the border with anything more than a few rocks landing several hundred feet short of any Israeli soldiers. This appalling indifference to human life, a gold standard exhibition of state-sanctioned extrajudicial murder and an escalation of the apartheid state in plain sight was as gruesome as it gets. And the international community, other than a few words, stood by, whistled into the air and walked away. And yet – so sources are saying, the British government, so desperate to cosy up to America as a no-deal Brexit looms is considering doing exactly the same – moving its embassy building from Tel Aviv to Jerusalem. An action such as this by Britain would sanction the prospect of no peace in one of the most contested patches of dirt on earth that has caused so much death, misery, chaos and division for decades. Whilst still a member state of the EU, Britain is bound by some of its foreign policy in certain areas – embassy offices being one of them. A post-Brexit Britain will be released from these EU restrictions. We emailed Britain’s Foreign and Commonwealth Office for some clarity. To be fair, whilst there has been no response, it has only been two days since we did so. Craig Murray, ex Britsh Ambassador makes an interesting point on the matter. Not only does this tighten US/UK relations on the one hand (no matter how bad the policy is) – it also gets to heap more pressure on Labour with its continuing campaign of anti-semitism accusations. The campaign to dislodge Corbyn has been, by and large, successful so far – as we have the worst Tory government in a very, very long time in power and yet no clear oppositional leader. It could be true that this is a fake news story, one planted for all sorts of reasons by all sorts of actors. However, Murray has asked for clarification as TruePublica has done. If the FCO decides not to answer these pertinent and important questions, one can assume that there may be some truth in it. We will update our readers once news emerges.